The outside of Evanston Public Library. The library is interested in hiring a full-time social worker to assist Evanston residents in navigating the facility and using its resources. Evanston Public Library staff are proposing to hire a full-time social worker in 2017. The main branch of the library, 1703 Orrington Ave., already houses several part-time student social workers, said library director Karen Danczak Lyons. A full-time position will give the library service more “predictability,” she said. 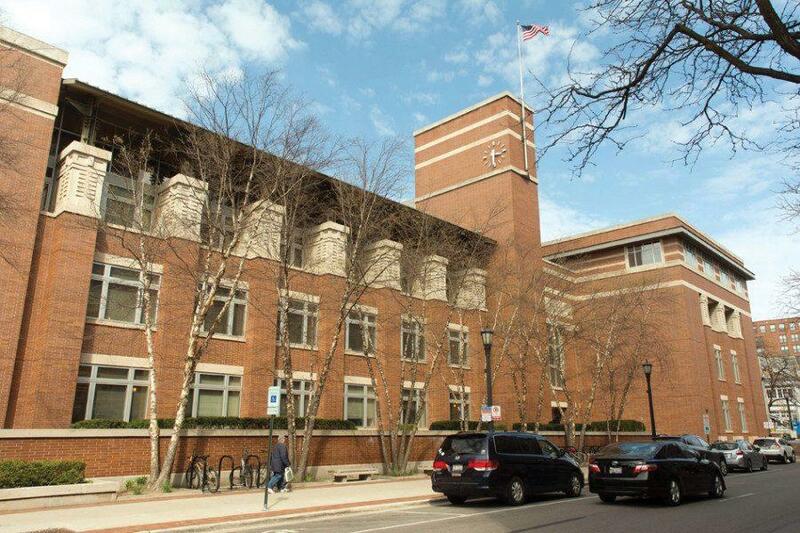 The position would primarily meet with library patrons who need the counseling and connect them to other social service agencies in Evanston. EPL already does this, Danczak Lyons said, but a full-time position would be able to build “trustworthy” relationships with both the patrons and the social services agencies in the city. The social worker would operate out of the main branch and the Chicago Avenue/Main Street branch. A public library is a good place for this sort of coordinated effort, Danczak said. The position would begin in July 2017 and would be grant funded, according to Library Board documents. EPL would contract with Presence Health for the position. Currently, college students working part time at the library are responsible for the duties this new position would perform. Having students conduct social work was helpful, the documents said, but made the schedule inconsistent. According to the document, Presence Health has previously helped EPL fill in the social worker gap in the summer months. Danczak Lyons said the position was needed now more than ever in light of cuts to social service agencies across the state during the state budget crisis. Cuts to agencies EPL had partnered with hurt the library’s patrons, Danczak Lyons said. “Some of our patrons that relied upon services no longer have access to those same services,” she said. Sue Loellbach, director of development for Connections for the Homeless, said having a social worker at the library would help social services agencies expand their network. “A social worker at the library could be a very good connection point between people who need services but are reluctant to engage any of the services that are out there ready to help them,” she said. Connections and EPL already have a “great” working relationship, Loellbach said. Library employees in the past have notified Connections if a patron is in need of housing support. An outreach worker for Connections also frequently visits EPL and other community centers, such as hospitals and police stations to see if services are needed, Loellbach said. Apart from offering the city’s homeless shelter and financial support to those on the verge of homelessness, Connections also refers those they help to other agencies who can assist them in other ways. A full-time social worker at EPL will be able to help them do that, Loellbach said. “Perhaps the social worker at the library will find out whatever kinds of services people need that we can’t provide and start initiating some of those other contacts even faster than we can,” she said. If approved in the proposed budget, the social worker would start in July 2017.